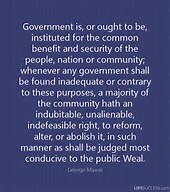 On June 11th, 1788 at the Virginia Ratifying Convention to the Constitution of the United States, Anti-Federalist George Mason remarked in reference to the House of Representatives, “They must form an aristocracy, and will not regard the interest of the people. Experience tells us that men pay most regard to those whose rank and situation are similar to their own.” Certainly, he did not mean a British aristocracy of artificial legal distinctions, special rights, duties, and privileges along perhaps with land from a centuries-long gone monarch. To what did Mr. Mason refer? In the revolutionary, radical Whig, American vernacular he meant two groups of men within an indistinct and fluid order, the order of the natural aristocracy. This natural aristocracy forms in all free societies. Men of various levels of intelligence, ability, daring and sometimes inherited wealth distinguish themselves from others by their wealth and property. Society expected them to fulfill civic duties in perhaps their church, charitable groups, and public office. Tobacco Planters exemplified the first group. They could hardly avoid civic responsibilities. Since its earliest colonial times, those who owned extensive estates, and were scrappy enough to hold on to them, ruled Virginia. When fellow Planters thought one of their own possessed the requisite maturity and judgment, they asked him to run for a seat in the House of Burgesses. Honor and law required he serve if elected, no matter his objections. The second were, in general terms the businessmen, professional men, merchants, and ship owners of the northern states, such as John Hancock, John Adams, James Bowdoin, Benjamin Franklin. Americans instinctively chose men of means and local stature to govern. Where a respected, small farmer could serve as town commissioner, he could not afford extended absences for a typical thirty to ninety-day session of the state legislature. There were no distinct class lines along the way between the subsistence farmer and the wealthy Planter or ship owner, but more of a gradation, a sliding scale between the two in a society of voluntary civil and religious interactions. As one moved up the political scale, one needed ever-more wealth to deal with the increasing personal inconveniences and burdens. Those who rose in a republic must first possess the attributes of at least some social superiority – wealth, education, experience, and connections – before acquiring political leadership. Yet, should higher government be turned over solely to such men, only to those who could afford the office at the permanent displacement of those who could not? Pennsylvania did not think so. Among the features of its 1776 Constitution as well as the Articles of Confederation was rotation in office, i.e. term limits designed to prevent an aristocracy from taking hold and to regularly make room for others of equal or perhaps superior merit. Let men remain in power long enough and they will regard the offices as their own. Rotation in office was an idea discussed and unfortunately rejected at the federal convention of 1787. So, in George Mason’s view, what clauses in the Constitution lent themselves toward an aristocratical government? To my surprise, it wasn’t the absence of term limits. It was the minimum of 30,000 constituents per Congressman of Article I, Section 2. It meant that ONLY men of means could afford to grip and grin, mix and mingle with enough people to achieve enough name recognition with any sizeable portion of their district. Early on, the Anti-Federalists determined that representation for the average man was out of reach. As time went on, there was no theoretical limit by the Constitution as to how many people would be represented in each district, and Mr. Mason assumed a practical, political aristocracy would grow. To the Anti-Federalists, 1: 30,000 wasn’t representation at all. Representatives were to mirror the opinions of their constituents as closely as possible, and this could only be done in very small districts in which representatives were almost on a first name relationship with constituents. As mirrors, they were to exercise far less independent judgment. George Mason was a Virginia delegate to the Federal Convention in Philadelphia over the summer of 1787. He arrived a week before it commenced and was present as his delegation smoothed the Virginia Plan, which was the framework for what emerged as our Constitution four months later. The 62-year old Planter was no wallflower. On May 30th, he supported discarding the Articles of Confederation and forming a government that acted upon individuals as well as the States. Of the highest importance was that the Constitution “provide no less carefully for the rights and happiness of the lowest than of the highest orders of Citizens.” Congress should be so close to their constituents that they, “think as they think, & feel as they feel; and that for these purposes (should) be residents among them.” In short, Mr. Mason wholly supported republican, truly representative government. America had to have a popularly elected house in its legislature. Mr. Mason feared districts composed of too many constituents would dilute the average man’s input to the point that only the wealthy would run for office, disregard the people’s interests, conduct themselves independent of their constituents and take on the trappings and attitude of those accustomed to lord over others. What was his solution for a nation expected to grow to hundreds of millions? He never said, yet he nonetheless accurately predicted the outcome of increasingly large Congressional districts. Each Congressmen currently represents over 720,000 Americans and unknown numbers of illegal aliens. Membership was set at 435 in 1911 when the US population was ninety-two million. That worked out to 211,000 per rep. But, George Mason was right, even if we doubled the membership and brought the ratio down to 360,000 or so, and added term limits, I’m not confident that together they would have any practical effect on bringing an out-of-control central government to heel. True representation in the hoped-for 18th century fashion is an impossibility.1 Yet, the prize of free government is not out of reach. IF an Article V COS restored some semblance of federalism through repeal of the 17th Amendment, AND doubled the size of the House AND added term limits, the aristocrats there would soon understand that they don’t have plenary powers, that another set of eyes in the state legislatures watch them, and in a few short years, they will have to live under the laws they passed. It is worth the effort. 1. I am aware of occasional rumblings about establishing ‘true’ representation via internet, without the need to assemble many thousands of reps in one place. I oppose any transition that inevitably terminates in direct democracy. Our democratic republic suffers from too much democracy now; any more of it will finish us off.